Complete Home Improvement can build beautiful decks that will add value to your home as well as enhance your home’s outdoor living experience. Now you can optimise your outdoor living area with stylish decks. With a wonderful decking approach that is designed to compliment your home, we feel confident that with Complete Home Improvement, you will gain a quality product guaranteed. From the simplest deck to the most extravagant custom-made deck, Complete Home Improvement aims not only to meet your expectations but also to exceed them. Choose from an array of our elegant decking options and make your home beautiful and more practical. A perfectly designed deck looks seamlessly beautiful as if it always existed and not something constructed later on. When you want to build a practical deck adjoining your front or back balcony or side veranda, timber decks are by far one of the popular options for many Australian homes. Timber decks add a rustic quality and enhance overall ambience of any home. A timber deck serves as a smart alternative to the conventional cement or tiled patio. Thus, more and more Australians are resorting to timber decking as their outdoor home extension. 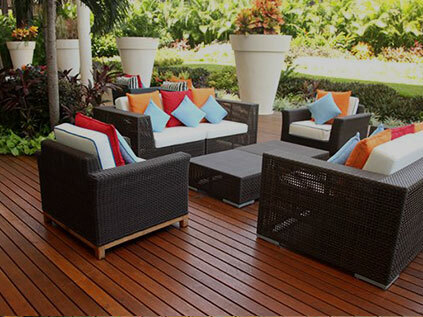 There is no better proposition than Complete Home Improvement when it comes to outdoor timber decking in Sydney. Our array of quality timber decks add value to your home and provide a practical space to relax and unwind. Moreover, a timber deck extension is a great way to improve your lifestyle bringing your al fresco space to life. As one of the premier deck builders in Sydney, Complete Home Improvement follows a meticulous approach keeping an eye for detail, so you can be confident about receiving a great product. Our range of decking solutions will suit any budget and home! If you’re looking for quality and innovative timber decking in Sydney, get in touch with Complete Home Improvement on 1300 912 293.